When I decided to embark on a topic that involved religion, I was doubtful that I could do a good job. I voiced my fears and concerns to hubby. But being the supportive man that he is, he replied that if I could do research on topics that are foreign to me like Bugs and Polar Animals, why not a topic that will not only benefit our children but also myself. It is so true that learning does not stop and I am discovering and learning new things as I read more to make myself understand better of the concept I wanted to deliver to Umar. The plan for this theme was a play date with his friends at home. However, Allah has better plans for me. I found out I was pregnant and I felt tired easily that I had to scrap the initial plan. I only managed to start the theme after Eidul Adha 2013 and it took me 4 months to complete the theme. We started by reusing our previous diorama and turning it into a Hajj-themed diorama. It could be completed in one day if I sat down and did everything. But I wanted him to be involved in the process as I wanted to talk about the Kaabah, pilgrims, ihram, stones and the two hills – Safa’ and Mawaa. The completion of the diorama took close to 3 weeks. The stones were made up of foam balls mixed with glue and gold paint. The two hills were recycled from the previous diorama – Polar Animals. The Kaabah was a cut out from his moisturizer box which I have kept in a cardboard box of recyclables. The pilgrims are made of soft clay. It was unintentional that the pilgrims was made in different shapes and painted in different colors. So our first activity involved a simple artwork of dotting using pegs and colored pom-poms, feathers and ice. This activity was to reinforce that tawaaf is done in an anti-clockwise direction and I repeated the explanation. As we were doing the activity, we recited together the du’a that one does while doing the tawaaf. 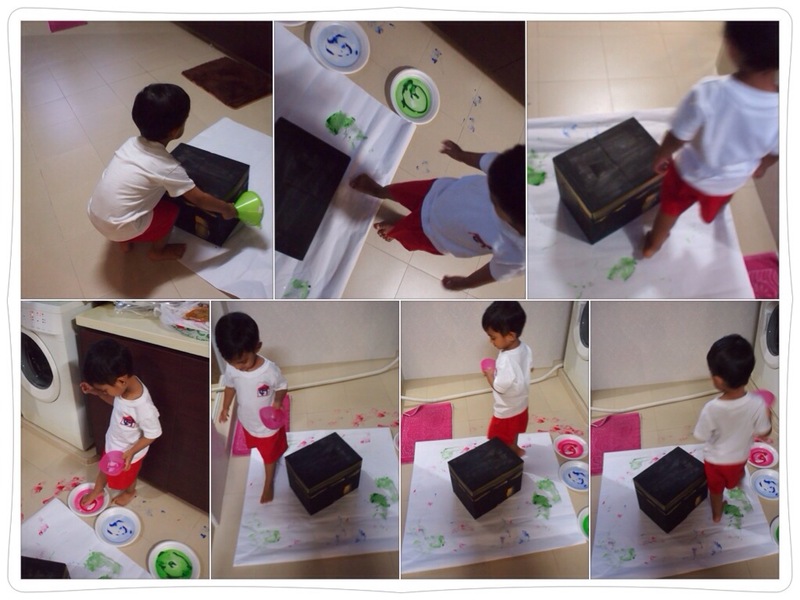 Our second activity involved paint-walking around a cardboard Kaabah we had painted much earlier. Again, I repeated myself and did exactly the same as above except this time he walked around the pretend Kaabah. Then we re-enacted the collection of 70 pebbles to do the stoning ceremony. I decided to make it into an aiming activity. I cut out shapes and pasted on a mahjong paper. 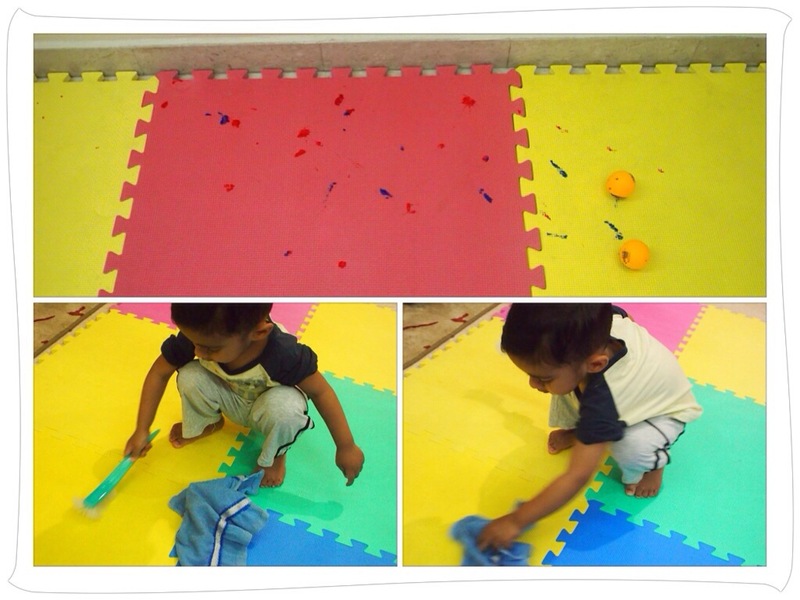 Umar is suppose to find orange ping pong balls hidden in a box of foam balls. After which, he is to dip the ping pong balls in paint and throw at the shape that I chose. At the same time, I explained the significance of the stoning ceremony during Hajj. Initially, I wanted to print cartoon-looking satan for him to aim but decided to abort the idea as I do not want to plant unnecessary images in his head. Not only that, I do not know what a real satan looks like as satan can exist in various forms. After the stoning ceremony, he insisted a cloth and brush to clean up his playmate. Bless his kind heart. Last but not least is the sacrifice of an animal for youself and to the poor. I hid sheeps attached to a magnet in a tub of expired flour and used a horse-shoe magnet to extract the sheep. Yep, he got to learn about magnetic force, the significance of sacrificial lambs and also slaughtering of livestocks in Islam. However, the magnets that I got from Learning resources was quite a disappointment. I had to put hematite beads on the sheeps to extract it out. Even then, the magnet had to be close to the sheeps before a very “weak” (almost not happening) attraction occurred. So Umar ended up picking out the sheeps with his bare hands. Haha! Later, I found out from a dear colleague that I could get string horse shoe magnets from Homefix, a D.I.Y. store in Singapore. I wanted to do puppet play to tell the story of how zam-zam water came about but my engine was not working smoothly and my puppet stage is still in my to-do list. 🙁 so I made do with just a verbal story-telling to Umar. It’s not really extensive but I’m glad I did it because I gained confidence and most importantly, I have stepped out of my comfort zone. 🙂 Alhamdulillah! Most play ideas are adapted from Pinterest. Information was collated through readings off websites, books, storybooks and a whole lot of discussion with hubby dearest. Hesham Hassaballa tells the story of Abraham, which inspired the rituals of the Hajj. And he considers why this is ultimately a story of thanksgiving. The years have passed, and his long-desired child has not come. Prophet Abraham and his wife have not been able to have any children, and as his bones age and his hair grays, hope fades. Seeing how much her husband wants a child and she cannot bear him one, his loyal wife asked him to take on another wife. Immediately, she is with child and bears him the son he has long desired. His joy is overwhelming. Yet, hardly has the joy been over when he was asked to take his wife and their newborn son on a journey through the hot sands of the desert. After a long journey, the man stops at a barren valley and leaves his wife and son. She runs after him: “What are you doing?” He does not answer. “Why are you leaving us?” He walks away without looking at her. “There is no food, no water, no life here. Why do you leave us here?” He does not answer. “Then He will not lead us astray,” she replies. His wife turns away, and the man continues to walk away. Soon, the small amount of food and drink that the man left with his family ran out, and the baby began to cry from hunger. Panicking, the mother searched near and far for any sign of food, water, or a coming caravan. There was nothing but barren and hot desert. She lost all hope and went back to watch her child die. To her surprise, a well had sprung at the spot where her son was crying, and she cried for joy. They were saved by a miracle. The wife and child settle in this valley called Paran, which later blooms into a desert city. Prophet Abraham came many times to visit his wife and son in this city, and the man loves his son very much. On one of these visits, Prophet Abraham has a dream in which he was sacrificing his son, Prophet Ismail. He awakens with the realization that this was no dream, but a command from the Lord Himself. On the day, he takes his son in order to sacrifice him. Prophet Ismail tells his father to turn his face away so that he will not weaken and fail to fulfill the Lord’s command. Yet, the knife would not cut his son’s neck. Time and again, he tried to kill his only son, his flesh and blood for whom he waited many years, but the knife’s sharpness failed. Just then, a voice called out to him: “Abraham! You have indeed fulfilled the command.” And in his son’s place, an animal was presented to Abraham for the sacrifice to the Allah. Once again, the son was saved by a miracle. Prophet Abraham and his wife has a son called Ismail. Prophet Abraham loves his baby very much. One day, Allah commanded Prophet Abraham to leave his wife and son at a barren valley. Wife: (asking Abraham) What are you doing? Why are you leaving us? Wife: Did Allah asked you to do this? Wife: InsyaAllah, Allah will bring us through this difficulty. Soon, Ismail’s Ummi realized that all of the food and drink ran out. Baby Ismail started crying from hunger. Wife: Oh no! We need some food for poor baby Ismail. She ran to and fro in the barren and hot desert but there was no food. As she ran back to her child crying, she found a well had sprung on the spot. This water in the well is called zam zam water. Why do Muslims perform pilgrimage? Awww. Such a sweet sweet post. Love love love all the things you do with Umar especially this particular 1!! And Shah is such a patient and supporting husband/dad. The 3 of you together are like my favorite happy family ever! I am so looking forward to your next baby. I think its genetic..you would always make such cute and smart babies! hehe. It must have been lovely to recite the dua during the tawaaf. Whenever we watch tv progs of ppl doing the tawaaf and my mom starts reciting the doa….I always wanna cry. Such an overwhelming feeling that I can’t really explain. Which researching for this topic, I am sure you somehow learnt a couple of things along the way. Thank for sharing. I have learnt something new today. You are always so nice with your comments, don’t you! Aww, insyaAllah. Yes, it was a lovely experience for me, Alhamdulillah. Haha Taj Mahal and Pyramids eh? Tu da 7 wonders of the world kan? errrm… taking a break now. LOL Eh i link your blog up to mine k!